For Caribbean people, names like Marcus Garvey, Grantley Adams and Uriah Butler are synonymous with hero for their roles in raising national and regional consciousness while also playing major parts in raising living standards and the hopes of the region’s peoples. But there are others whose contributions, while not as history making are much more significant to the people whose lives they touch. It is a group of unsung heroes who, since 2003, FirstCaribbean International Bank has endeavoured to bring to the forefront. For 2008, volunteer workers from St. Vincent and the Grenadines, Barbados, Dominica and Antigua have emerged as the most heroic in the bank’s region-wide Unsung Heroes programme. When the distinguished panel of regional judges met in October to make their final selections from 25 regional finalists, Veolant Cupid of St. Vincent and the Grenadines, a community volunteer credited with touching many lives, was chosen the top Unsung Hero for 2008. Runner-up positions went to prison outreach volunteer, Thomas Watts of Barbados, and Patsy Thomas, noted for her work assisting the poor in the Carib Territory of Dominica. A special commendation award for her work with orphaned children will go to finalist, Gwendolyn E.M. Chambers, a retired educator of St. John’s, Antigua. 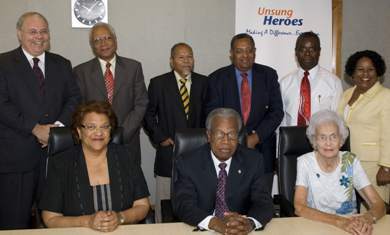 The four champion Unsung Heroes will be honoured early 2009 at a ceremony in Barbados, which will simultaneously launch the 2009 Unsung Heroes programme. Having, as local finalists, already received award donations of US $6,000 each towards the development of their benevolent work, the regional runners-up will now receive an additional $US5,000 each, while the overall hero will receive a further US $7,500. Chairman of FirstCaribbean International Bank, Michael Mansoor, issued heartiest congratulations to all the regional finalists, but particularly singled out the final four overall heroes for having had the courage and determination to take action and make a significant difference in their communities. Mansoor said the FirstCaribbean Unsung Heroes programme is a credit not just to FirstCaribbean, but to the benevolent spirit and community-mindedness of the people of the region. “We could not have been more impressed with the quality of submissions both at the local and regional levels for this programme; and looking at the outstanding persons nominated from around the region, we would not have wanted to be on the panel of judges, as their task certainly could not have been an easy one,” Mansoor said. Inaugurated in 2003, the Unsung Heroes regional programme is FirstCaribbean’s flagship corporate social responsibility initiative which has contributed millions of dollars in funding for worthwhile community projects over the years, and continues to be of great assistance to persons, within the region, who quietly go about doing good. 2008 Unsung Hero, Mrs. Veolant Cupid, 61, has been for many people a tower of strength in the rural community of Lauders, St. Vincent. She has established outreach programmes for orphans, the elderly, adult education, poverty assistance, and even recognition of police officers, nurses and teachers. Runner-up, 79-year-old Thomas Watts, the lone male among the four regional winners, has been doing volunteer work helping to successfully reintegrate former prison inmates into society for nearly three decades. There are many success stories from his programme which has had impact both locally and regionally, has been self-funded, and has with its success attracted other volunteers to offer their assistance. Patsy Thomas, 47, the second regional runner-up for 2008, has worked in Dominica’s Carib Territory in the areas of poverty assistance and children’s education. She has earned the great respect of the people of the Carib Territory. The recipient of the Special Commendation for 2008, 78-year-old retired Antiguan educator Gwendolyn E.M. Chambers, and best known there as Auntie Gwen, is being honoured for her work with orphans and less fortunate children in the community. The Unsung Heroes programme started with a pilot programme in four countries in 2003 and has grown to encompass all 17 countries in which FirstCaribbean operates within the region. The 2008 judging panel included Sir George Alleyne, the Chancellor of the University of the West Indies; Sir Neville Nicholls – retired President of the Caribbean Development Bank; A. Leonard Archer, the former Bahamas Ambassador to CARICOM; Charles Williams, the Carib Chief from Dominica; Jones P. Madeira - Manager of the Information and Protocol Division of the Judiciary of Trinidad and Tobago; Marie MacCormack Q.C, retired Barbados High Court Justice; and Dame Olga Lopes Seale, renowned Barbadian social worker. Kudos to all the unsung heroes of the Caribbean! Thanks for all that you do! Nuff respect!